Throw in the mysterious appearance of a fugitive killer from Las Vegas, who is intent on tying up loose ends in Dublin and the Guards have more than enough to deal with. This is the first of instalment of the Garda Cathy Connolly series and it definitely doesn‘t hold back. The writing it superb, the plot is interesting and gripping, characters are multidimensional and easy to relate to. The various elements of the story are well written. Masterfully weaving together the tales of Mary‘s past and present dementia like struggles, Zoe‘s world slowly falling to pieces around her and the personal life of Cathy Connolly mixing with her professional duties. It would be easy to assume that something would get lost in the myriad of characters and details but as far as I was concerned, nothing did. The detail in this book was incredible, even the intricacies of the art work created by Zoe was thoroughly detailed, so much so that I could almost imagine the canvases. 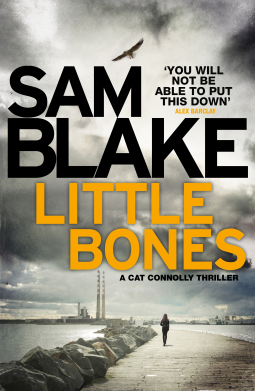 Sam Blake is a pseudonym for Vanessa Fox O’Loughlin, the founder of The Inkwell Group publishing consultancy and the hugely popular national writing resources website Writing.ie. She is Ireland’s leading literary scout who has assisted many award winning and bestselling authors to publication. Vanessa has been writing fiction since her husband set sail across the Atlantic for eight weeks and she had an idea for a book. Dublin is in the middle of a heat wave and tempers are running high. The Celtic Tiger is well and truly dead, activists have taken over the headquarters of a failed bank, the trial of three unscrupulous property developers teeters on the brink of collapse, and in the midst of all this, along comes a mysterious organisation hell-bent on exacting bloody vengeance in the name of the little guy. Paul Mulchrone doesn’t care about any of this; he has problems of his own. His newly established detective agency is about to be DOA. One of his partners won’t talk to him for very good reasons and the other has seemingly disappeared off the face of the earth for no reason at all. Can he hold it together long enough to figure out what Bunny McGarry’s colourful past has to do with his present absence? When the law and justice no longer mean the same thing, on which side will you stand? The Day That Never Comes is the second book in Caimh McDonnell’s Dublin trilogy, which melds fast-paced action with a distinctly Irish acerbic wit. I have to admit, when the second novel comes out in a series that I’ve fallen in love with I am a little hesitant. What if the second book is rubbish? What if the characters have lost their sparkle and interest? What if….what if….what if? But my worries were unfounded, Caimh McDonnell has written another cracker of a book, encompassing some of my absolute favourite characters ever to grace our pages and I have to say, I would love to see them cast in real life just to see the hilarity of the situations. For those not familiar with Caimh’s writing (catch yourselves on and check out the review of “A Man With One Of Those Faces” and then buy a copy as it’s on special offer right now), it’s a whirlwind of hilarity, catastrophe and sheer madness with characters that are various shades of interesting. “The Day That Never Comes” continues much in the same tone as book one, Paul Mulchrone has a problem, well quite a few problems, but the four legged, desk defecating Maggie is his main one. Paul is still as feckless, cynical and a victim to poor judgement. Brigit Conroy is still a fierce woman, one you’d take on at your peril and Bunny McGarry…..where do I begin with the hurley brandishing, grumpy ex Gardaí? He’s missing, and no one’s seen him for days. I’ll not bore you by rehashing the plot, but I will say it’s clever. There’s a darker feel to this book, the characters have developed from the previous book but retained the key aspects of their respective personalities. Brigit has definitely fared well, she has become stronger and fierier in the interim. The way in which she handles herself publicly is confident and takes no nonsense, but she wears her heart on her sleeve when it comes to more personal matters which is endearing really. The pace of the book is perfect, it’s a quick read with plenty satire and moments that will have a reader laughing out loud. The plot is well crafted and there’s an authenticity that pours from the pages, the subtle nuances are spot on, you can almost hear the accents, experience the cultural aspects all through the innovative use of language. You can buy your copy of “The Day That Never Comes” in the UK here, and USA here. Don’t forget to check out the other stops on the tour (and go back for the ones you’ve missed!) there’s some great reviews, guest posts and a cheeky giveaway! The Perfect Gift is a heart warming tale about mothers and daughters. How they must learn the diplomacy of compromise, to build trust and let go of secrets in order to move on in life. This is Emma Hannigan’s tenth novel and quite possibly her best yet. Her writing flows beautifully, evoking emotions from readers at the very beginning of the book with a deeply moving prologue that had this hardened crime fiction fan tearing up. Set in Ireland, the story centres around three women, who have all suffered great sadness and pain. Roisin, adopted as a baby by Keeley and Doug has always struggled to fit in and find her place. She decides to return home to set up her own business after travelling. But she has a secret that she has never shared with anyone. Keeley runs a B&B with husband Doug, and is very successful. But she also holds a secret, one that she has kept from her husband. Finally Nell, a recluse who lives in an old lighthouse, her only company is her cleaning lady Mo. Nell has a past she would rather forget about, but the discovery of a young runaway pushes her to face her past. Each of the women are forced to confront their secrets and the revelations open their eyes to a different world, one where they no longer need to protect themselves from hurt by hiding away. Characters are truly wonderful, Roisin is such a spirited character, her ambition and enthusiasm are infectious, almost leaping off the page at the reader. They are all believable and easy to relate to. This is the sort of book to pick up when you need to slow down, lose yourself in a good book and just relax – an escape if you will. Despite guessing some of the secrets part of the way through this book I still thoroughly enjoyed it. 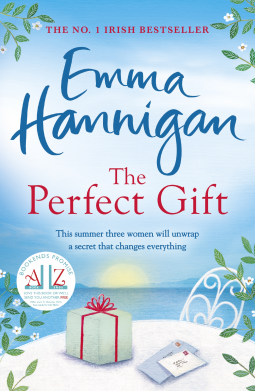 Reading Emma Hannigan’s books are like catching up with an old friend, they’re comforting and wonderful, you feel emotional but ultimately you feel a sense that everything is ok in the world after reading it and it reminds you to appreciate the family you have. You can buy a copy of The Perfect Gift here.